For our first post of 2018, we are delighted to bring you some background information and reviews about one of our books. Blackbirds Baked in a Pie is an entertaining memoir by Eugene Barker, who used to be the private secretary of Prime Minister Edward Heath in the 1970s. Born in Penarth, South Wales, Eugene left school at 16 to work as a trainee journalist on two local newspapers. This was in the days when discrimination against women in the workplace made the job twice the challenge it was for male colleagues. Moving on to an assignment in Holland at a Unesco conference, she stayed on for two years, learning the language and working with companies in Amsterdam struggling to get back on their feet after the horrors of the second World War. Studying with the Open University in her late forties, she became a Tutor/Counsellor after graduating, before moving briefly back into journalism. She then went on to work in the House of Commons - eventually becoming Senior Secretary to Sir Edward Heath. Not the type to retire in her sixties, however, she took on the running of an auberge in France, and this book, Blackbirds Baked in a Pie, is a lively and affectionate account of her time there. Eugene is now in her late eighties, and until quite recently she used to travel around Britain with a suitcase full of books and give talks wherever she could; apparently these talks were not so much about her illustrious career at Number 10 (as one might expect), but about her retirement career as a Bed and Breakfast host in the French Pyrenees, which we suspect she found even more interesting. However, these days Eugene is no longer able to get about and promote her book as she used to, so we decided to give her memoir a blog boost by sharing some of the reviews she's received. "Sir Edward Heath's Private Secretary didn't take retirement sitting down... At age 60 Eugene Barter, along with her sister and brother-in-law, moved to a house in the foothills of the Pyrenees to start an auberge. This is the story of her experiences. Humorous and often self-mocking, always gentle and quirky, Eugene takes us on a journey through the countryside and its people, Catalans and French alike, with a good dose of her German and English guests thrown in. Her love of the region shines from the pages - surely a timeless joy for all ages. Recipes from Rozinanate: The second half of the book focuses on the recipes with which Eugene used to feed her guests, though still interleaved with her engaging anecdotes. English, Catalan and French recipes, all easy to follow, sit side by side, and there are conversion charts to help step through the metric and imperial standards, and maintain that essential entente cordiale!" "I read this book with great enjoyment and an appreciation that the author was already over sixty when she courageously embarked on her new life. It is set in the pyrenees of south west France and is almost as much about the Catalans as it is about the French of the area. Ms Barter has some lovely anecdotes about both the locals and her guests at the B&B she and her sister started. In fact I wished there were more stories and fewer recipes, but that's because I'm not a cook and I love France! Altogether, I enjoyed the book very much and it was amusing and entertaining to read." "Take a few dollops of Peter Mayle, add a generous measure of Julia Child, drizzle with red wine then simmer slowly under sunny skies for seven years. 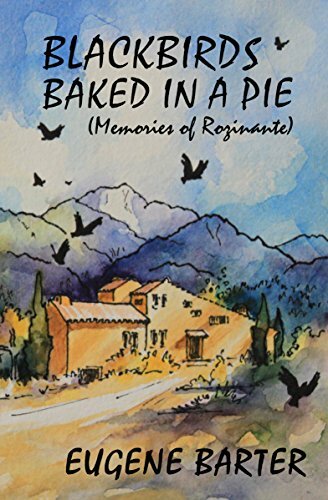 The utterly charming result is Blackbirds Baked in a Pie, Eugene Barter's delightful collection of tales about her seven years of running a guesthouse in the Pyrenees-Orientales. And she's thrown in her favourite recipes too!"